For many years sage advice from legal counsel, consumer advocates, and friends has been to “get it in writing.” In subrogation cases, what is “in writing” can have a substantial effect on the viability of recovery. In many subrogation cases, the recovery specialist is confronted with one or more “writings,” including a lease, rental agreement, contract, or other type of agreement, containing various provisions which may affect the right of the insurer to pursue subrogation against the persons responsible for causing the loss. Discussed below are ten questions/issues the recovery specialist and subrogation attorney should be aware of in reviewing a new loss involving one or more agreements entered into by the insured. It is important to identify the parties and their involvement in any written agreement. For example, although an agreement between the insured and the third party may contain various provisions which might limit or prohibit recovery against the parties to the agreement, it may be that one or more of the parties responsible for causing the loss are not parties to the agreement. In particular, this issue could arise where a tenant has subleased the property or permitted a third party to temporarily or occupy or utilize a portion of the property. Issues can also occur in an agreement between an insured and a contractor, which might contain certain provisions limiting or waiving liability against the contractor. However, if subcontractors have been involved in performing the work which caused the loss, the subcontractors or other third parties’ responsibility for causing the loss may be unaffected by limiting provisions in the agreement between the insured and the contractor. 2. Is the Responsible Party Named as an Additional Insured? In many instances, a lease or other agreement may require one of the parties to name other parties to the agreement as additional insureds under their insurance policy. If the agreement requires another party to name your insured as an additional insured, then there may be successful avenues of recovery/contribution from the third parties’ insurer. Alternatively, if your insured is required to name a potential defendant as an additional insured, the anti-subrogation rule may prevent recovery against that party. 3. Does the Agreement Contain a Waiver of Subrogation Clause? 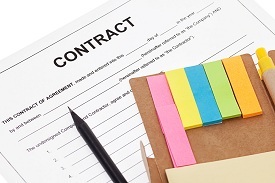 In many agreements and leases, some type of “waiver of subrogation” clause is included. While, under many circumstances, the waiver of subrogation clause may prevent subrogation against the parties to the agreement, there may be circumstances where the waiver may not apply. For example, if the agreement or lease was terminated prior to the loss, then the waiver provisions may not be applicable. Additionally, if a violation of law, gross negligence, or intentional act was committed, the responsible party may not be afforded the protection of the waiver. Also, the specific language of the waiver of subrogation clause should be examined carefully to determine whether the provisions apply to the circumstances of the loss, and whether there are any conditions that the parties were required to perform as a pre-requisite to the implementation of the waiver provisions. 4. Does the Agreement Contain a Waiver of Liability Clause? Many agreements and leases contain general waiver of liability provisions wherein one party releases the other from liability, which may prevent recovery by the insurer against the party relieved from liability in the agreement. However, this will not always be the case. For example, in some jurisdictions, if the actions of the responsible party are found to constitute active or affirmative negligence, and the limiting language is not explicit, the waiver may be found unenforceable. Likewise, if the provisions are found to affect the “public interest”, then the release may also be found not to be enforceable. Also, if the conduct of the responsible party is intentional or in violation of law, the waiver will likely not be enforced. Finally, the specific provisions of the waiver must be closely examined to determine whether the specific circumstances of the loss fall within the parameters of the waiver. 5. Does the Agreement Contain an Indemnity Clause? A properly drafted indemnity provision may provide an express agreement upon which the insurer can pursue recovery or may prevent an insurer for pursuing recovery against certain parties protected by the provisions. As with other discussed provisions, the indemnity provisions must be examined carefully to determine the precise obligations that are created. For example, the indemnity obligations may only relate to one of the party’s conduct. Thus, the subrogating insurer may be able to utilize the indemnity provisions to pursue recovery against the obligated party. Other indemnity provisions may obligate a party to not only defend and indemnify the other party for the indemnifying party’s negligence, but also for the indemnified party’s negligence. 6. Does the Agreement Require any Parties to Carry Insurance? All agreements should be carefully examined to ascertain whether any responsibility has been placed on a particular party to carry a liability, and/or casualty coverage. Depending on the circumstances, the responsibilities for carrying insurance may create an opportunity for recovery. For example, if the agreement requires someone other than the insured to carry insurance covering the loss in question, and the insurance is procured, then the insurance obtained under the agreement may be considered to be the primary policy, and provide primary coverage for the loss. Also, if the agreement places responsibility upon a party to carry liability insurance for damages caused by their negligence, such provisions will be helpful in asserting that the parties did not intend to waive recovery rights against each other, given that the party was required to carry the liability insurance for its actions. 7. Does the Agreement Place Responsibility for Repair on a Particular Party? Many rental/lease agreements contain provisions requiring one of the parties to make repairs to the property. Depending on the language of the clause and the factual situation giving rise to the loss, the language could be helpful to a recovery claim. For example, if there are provisions within the agreement that provide a tenant will be responsible to pay for damages caused by its negligence, such provision may be persuasive in overcoming an “implied co-insured” defense sometimes raised in a landlord tenant situation. 8. Does the Agreement Contain an Attorney’s Fees Clause? The existence of an attorney’s fees clause may permit the prevailing party in a legal action to recover its incurred attorney’s fees from the unsuccessful party to the lawsuit. In many jurisdictions, the attorney’s fees clause has been applied to a subrogated insurer, which could either entitle, or require, the insurer to recover, and/or pay attorney’s fees, depending on the outcome of the action. In evaluating the feasibility of pursuing a recovery action involving an agreement with attorney’s fees clause, the insurer should consider and appreciate the existence of the clause, the potential of recovering its incurred attorney’s fees in a successful action, and being required to reimburse the other party for its attorney’s fees should the insurer be unsuccessful. 9. How Were the Damages Caused? The circumstances as to how a loss occurred may affect the enforcement of the various provisions contained within the agreement. Whether they were intentional acts, violations of law, or acts that constitute gross negligence may provide means for avoiding otherwise enforceable limiting provision in the agreement. Likewise, under certain scenarios involving indemnity provisions, the type of negligence of the party, i.e. active as opposed to passive, may provide an opportunity to pursue recovery and/or avoid responsibility. 10. Who are the Parties Involved in the Loss? Finally the circumstances of the loss must be examined to determine whether parties other than those named in the agreement were responsible in whole or in part for the damages, as those parties may not be entitled to rely on the provisions of the agreement and under appropriate circumstances, may be pursued for recovery.